An amazing Bulgari gemstone necklace. 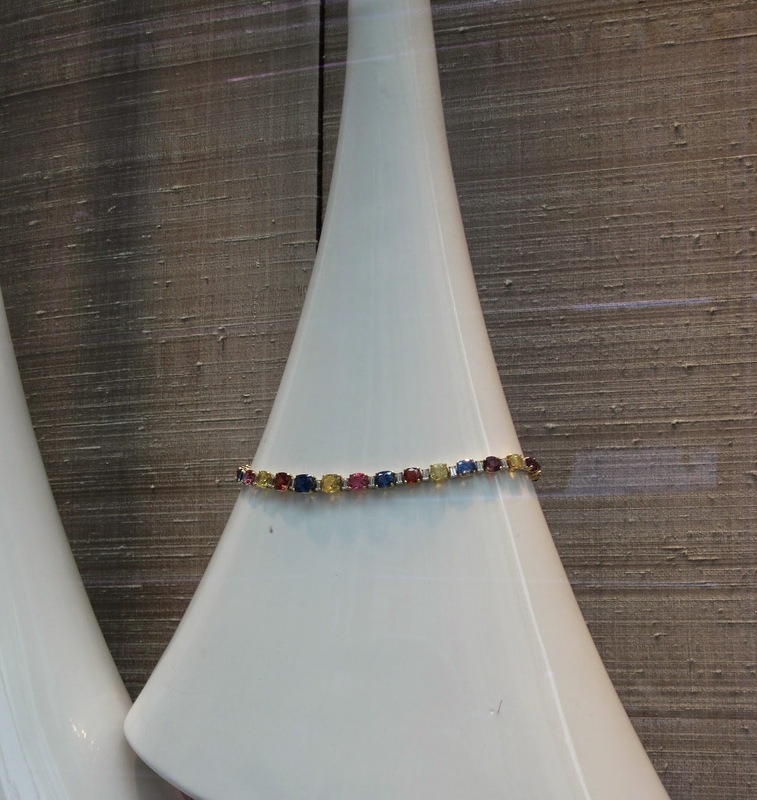 On my way to Bergdorf and Cartier on Fifth Avenue back in July, I was stopped in my tracks outside Bulgari, also on Fifth Avenue, by this drop-dead gorgeous multicolored gemstone necklace set with baguette diamonds between each stone. I may have seen this beauty back in summer but I would love a necklace like this to wear any time of the year! I think it would be amazing in summer with a white dress or crisp white shirt, or in the winter over a black cashmere turtleneck. Can you imagine? Detail of a Bulgari necklace. I think I just died of love. Another necklace featured paler cabochon gemstones and I found it just as stunning. I love this shot of this couple and their dog! 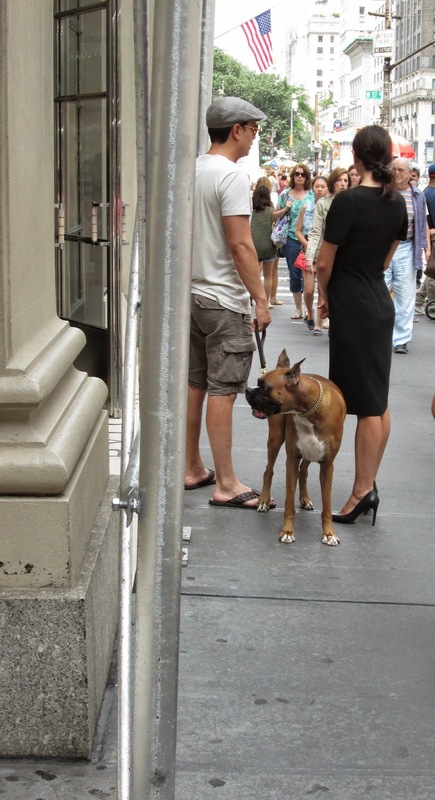 I figured she worked at Bulgari and was on a break, her boyfriend/husband was visiting her, and he brought the dog, a beautiful Boxer! 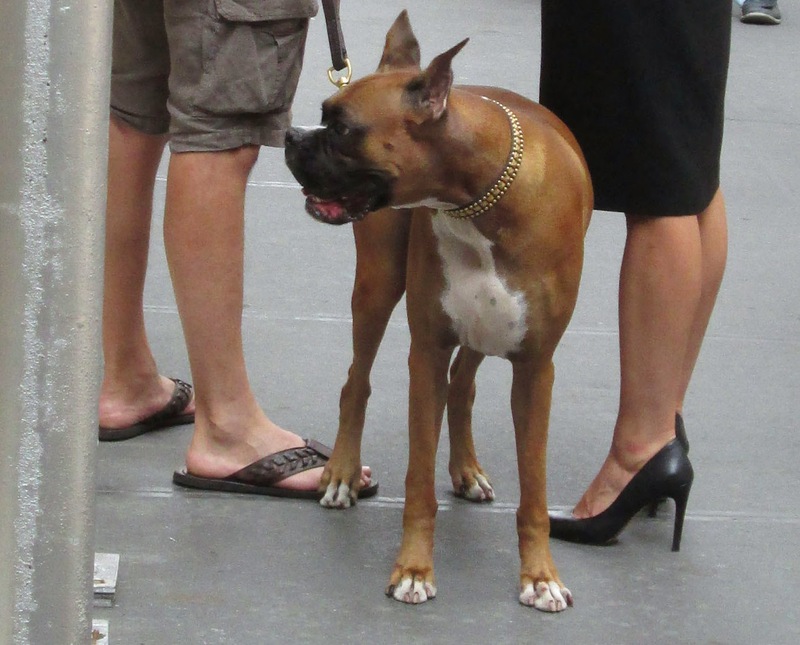 Then I noticed the dog wore a studded collar. I would love nothing more than to fasten a rhinestone collar around the neck of our cat, Tippi, whom I sometimes call Little Elizabeth Taylor when she is playing with her feather boa (Oh Liz, the glamour! ), but Tippi is a bit edgy and I have a feeling she is Not That Kind of Cat and I would have my hands scratched off for my troubles. Tippi in my Sylvia Steininger New York tote, which she thinks is hers. I will have to add Bulgari to my list of window stops next time I’m in the city. Put it on your list too, it’s at 57th and Fifth Avenue, across from both Tiffany and Bergdorf. 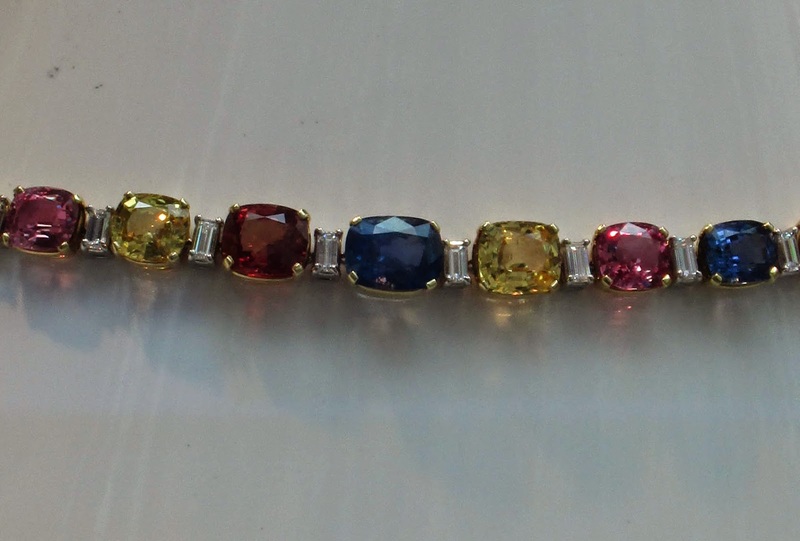 Would you wear a multicolored gemstone necklace? Does your dog or cat have a bejeweled or studded collar? Yes I would and I must say I prefer the cabochon one! My mother's pup Dolly, a black cocker spaniel, true to her working dog roots dons a tartan collar. That necklace is quite something but rather an unimpressive way of displaying it I think. Obviously, Bulgari knows their customers better than I do. Jill, Would I wear a colored stone necklace - of course I would. 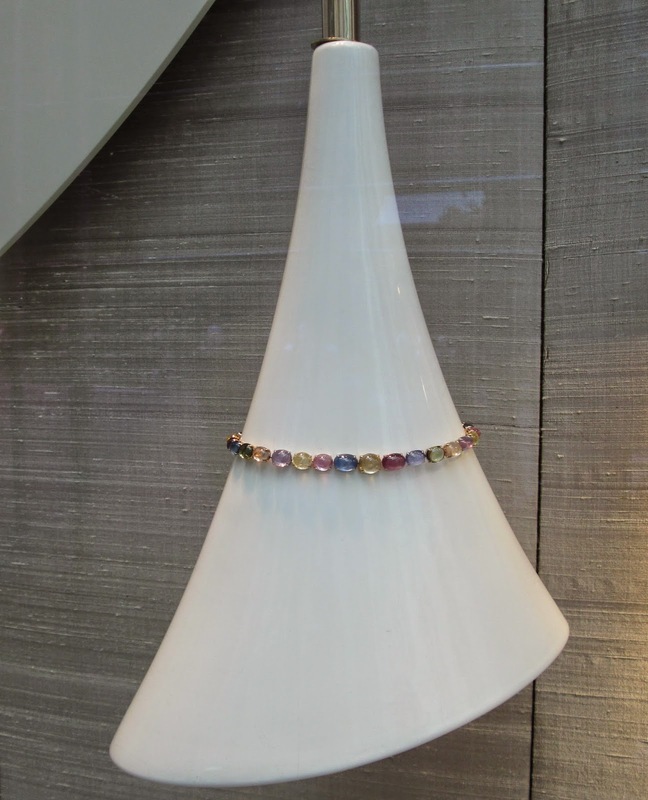 I will be in the City again next week & will take a look at Bulgari's window & ogle at the beautiful necklace. I love that couple with the bejeweled boxer. She is all dressed up wearing really high heels & he is a cool hipster, hat and all. The guy looks right out of Brooklyn. How does the girl stand possibly all day in those heels. Oh, forgot - she's young. :-) Both necklaces are beautiful, but I would prefer the Cabochon necklace for myself. The picture of the couple with the dog is great. But if I had a dog or a cat I think I'd just let them go with a comfortable leash. Hi Rosie! If you see anything fabulous at Bulgari, let me know. I took these pictures in late July so I'm curious what they have in the windows now! Hi Happyface, another vote for the cabochon! It really is a stunning necklace, isn't it? I would love a chance to try that baby on! What a fun post! Beautiful jewelry, a cute street scene, and an adorable kitty! Jill, passed the Bulgari windows today,and there were a lot of BIG diamond statement necklaces - the kind you would have seen on Elizabeth Taylor; or on the red carpet. There was a diamond & sapphire necklace that was very old Hollywood. 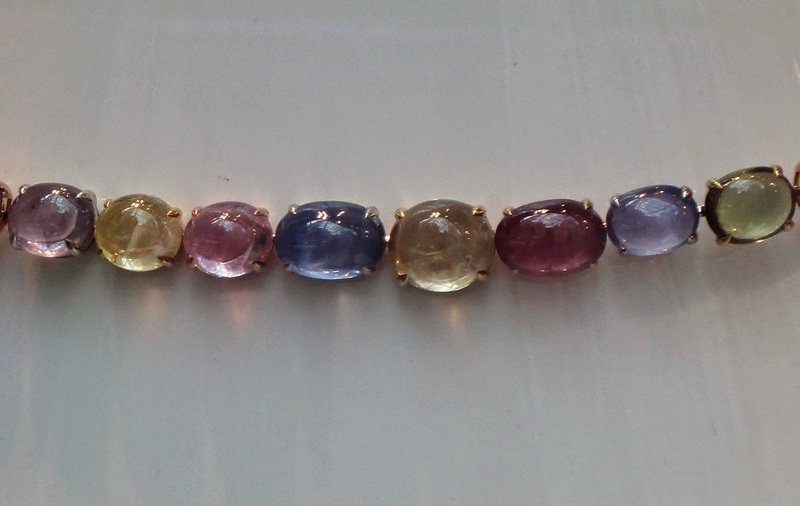 Each stone was the same size very large & round; and, alternated between sapphire & diamond - very old Hollywood that stood out.